I like funky, offbeat styles or a combination of classic with a funky twist. I love working with wire, and I am very impulsive when it comes to my work...I might see something that gives me an idea, and I HAVE to go try and work out what comes to me. I sort of work by the seat of my pants...even I AM sometimes surprised at the final result! I love texture, fabrics, color, design...almost anything can be inspirational to me. Color, texture and mood. If I have a mood that feels important, I might try to recreate it in jewelry. Wire! I don't like anything plastic or cheap looking. I like working with odd shapes, and different types of materials that might be integrated into my design, i.e. leather, etc. A necklace I saw in a store...I wanted to create something similar but something that looked more like a garden to me. I just dug in and it came together on its own. 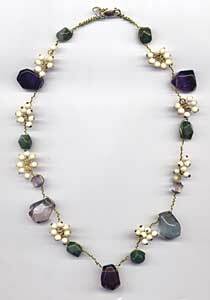 In 1999 I began making jewelry using my grandmother's old jewelry as gifts for my sisters. I think my grandmother...even though she had already passed away, I just felt this strange calling to her jewelry that would not go away. When I finally gave in to it, voila! I have sold handmade bridal gowns, veils, and children's clothing that I designed, and a line of shorts for volley ball players. I also sold two separate designs to J. Jill. I never studied in school, but my Dad was an artist and my mom taught ceramic classes...I guess my family inspired me, too. In a bead design magazine. Writing, photography and sewing...also carpentry and anything I can do with my hands. I taught jewelry making classes for five years and still keep in touch with my students. Emotionally it can keep me focused, be a stress reliever or give me a great sense of satisfaction! I do not currently sell, but I have sold to stores, catalogs, and I did shows...LOTS of shows, and I have taught classes and sold online as well. Yes, I sold jewelry to support people with gastro paresis...and women who had to have their colons removed as a result. YES! HAVE FUN!! Find your own style and don't compare yourself to anyone! Do it for YOU!